What better reason to craft than for a baby shower?! Here is my first attempt ever at making a baby quilt. I was feeling very purple the day I picked out the fabric. Hope the mother to be likes purple too. I used the hexagon template here because I liked the size. You will want to cut out 9 hexagons of each of the 7 fabrics. If you plan on using quilting quarters, make sure to cut them close together because that will be just enough fabric for 9 hexagons. I followed the tutorial in this video to machine sew all of the hexagons together. Sorry old lady at the fabric store, I decided not to paper piece my hexagons (whatever that is). After sewing all of the hexagons together, I trimmed the sides, layered it with the batting and backing, and used my machine to “quilt” around the hexagons where I have drawn the red lines in the image below. I forgot to measure the finished quilt, but I think it ended up being about 32″ x 36″ or something like that. You could either buy some quilt binding or just do what I did and cut the backing bigger so that it could be folded over the top. Beautiful, Jessica! I’m sure the baby mama will love it! I love the hexagons and PURPLE! Such pretty fabrics! This blanket is VERY cute!! I love it. I wish i knew how to sew. I do not even own a machine, but I would love this for a big bed too. Haha….Just Beautiful! Thanks! 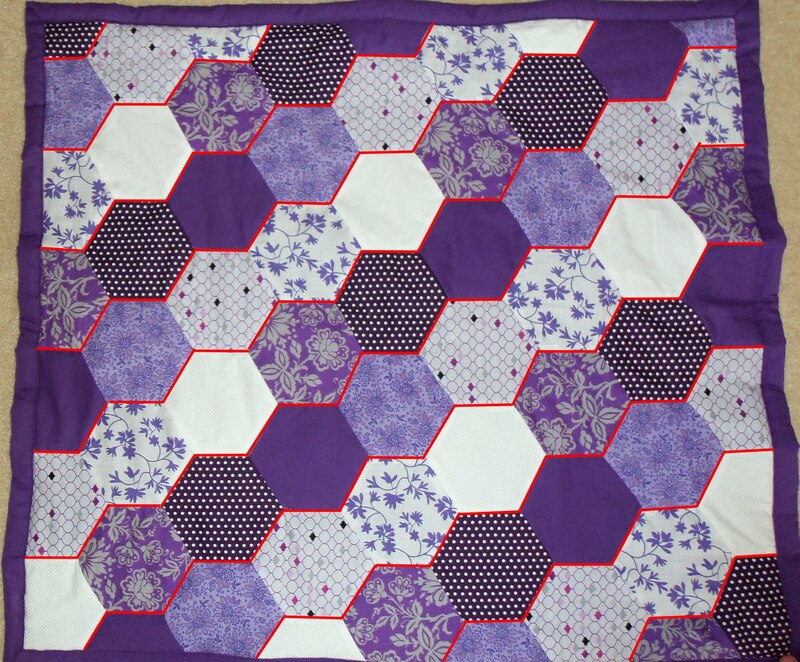 I love hexagons on a quilt! So fun!